Vincent Wong (王浩信) and Yoyo Chen‘s (陳自瑤) marriage has been plagued with divorce rumors since TVB began heavily promoting the 35-year-old actor to their line of leading actors in 2016. Although the couple verbally denied the allegations and made public appearances together to dispel the rumors, the speculations have not died down. Now, there is a new issue between the couple. 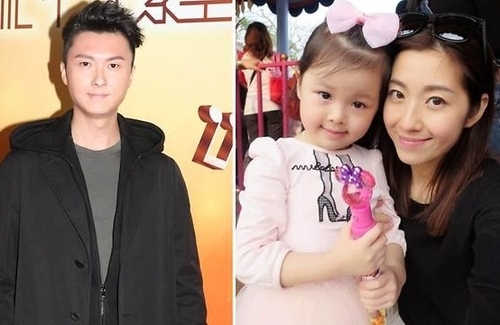 The 37-year-old Yoyo allegedly wants to have another baby to enhance their marriage and provide a companion for their six-year-old daughter QQ (靖喬), but Vincent is not cooperating. Yoyo has been frequently meeting up with Fanny Lee (李漫芬) when she doesn’t have work to see Fanny’s 10 month old baby girl. Earlier, the two posted their meet up on social media, and Yoyo was seen excitedly carrying Fanny’s baby. Even when the mother and daughter were leaving, Yoyo needed to take a selfie with them and she was quite reluctant to leave. Yoyo’s baby fever is obvious, but Vincent’s hectic work schedule – back to back dramas and movie cameo appearances – makes it hard for them to try for another baby.